Askaridы - round worms, that can be distributed throughout the human body. Ascaris adults found in the gut, respiratory system, a heart, the brain. 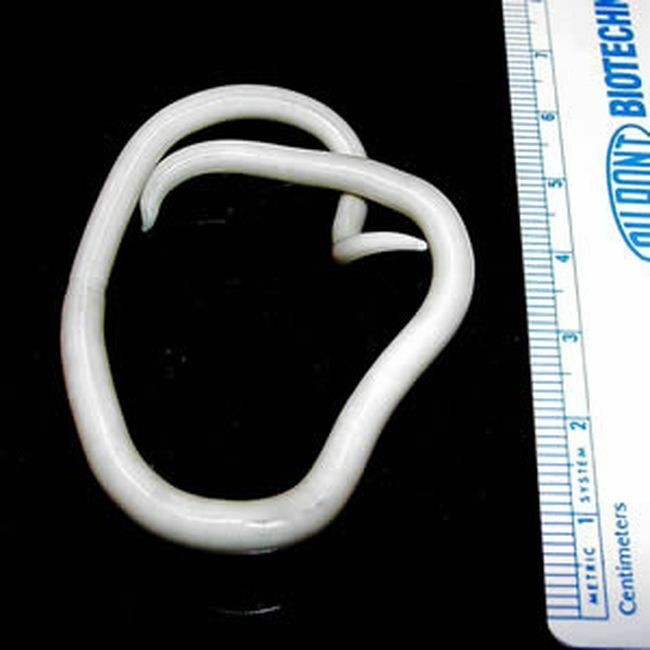 Ascaris human can reach huge sizes: females can grow up to 40 cm in length. Many people wonder: It looks like roundworm and what ascariasis? Externally, they resemble the White Worm, sharpened on both sides. Ascariasis - a parasitic disease, which is caused by the penetration of the body of Ascaris eggs. 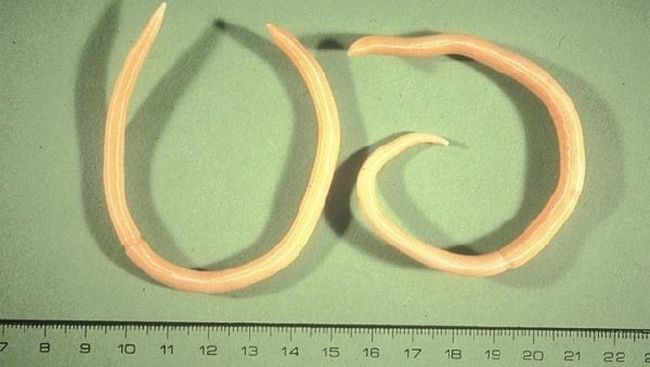 Ascariasis is common in most climate zones. The main cause of infection - failure to comply with the basic rules of hygiene. of Ascaris eggs come from faeces of an infected person into the soil and can exist so long. When there comes to them a favorable period, eggs ripen. For ripening needed: Soil temperature is about 24 degrees, humidity, oxygen saturation. At this time, the contact with contaminated soil, water, food (berries, vegetables, fruits) It leads to the colonization of the skin with helminth eggs. In this way, in violation of rules of personal hygiene roundworm enter the body through the oral cavity. It is because of this most of the infections recorded in young children, who often forget to wash your hands after a walk. After entry into the body of mature eggs turn into larvae, which in turn penetrate through the mucosa into the portal vein, can be moved to any body. After the larvae penetrate into the lungs and, together with phlegm into the intestine, there is its transformation into an adult. The process just described is known as the early stage of the migration. The duration of this period is about 3 months. The next stage is called the late E.. During this period, the female adults lay eggs, wherein one individual may be delayed until 250 thousands of eggs per day. In humans, the eggs can not mature, for this they need a soil, therefore, they are simply excreted in the faeces. The adult can live in the body for about a year, and then dies. Consequently, ascariasis may itself undergo a year, if there is no new infection. Symptoms of Ascaris infection in adults may vary and depend on the intensity of infection, parasites localization, stage of disease development. In the first phase, no migration pronounced signs ascariasis. There may be a slight indisposition, a slight rise in temperature, not exceeding 38 degrees. Sometimes there is a dry cough, accompanied by expectoration. Auscultation doctor may hear crackles. Specific symptoms during larval migration is the occurrence of allergic skin rash. Most often, there are allergic dermatitis and rash on the hands and feet. Changes can be detected in a blood test. To 30-40% may increase the level of eosinophils, may intermittently increase the amount of leukocytes. Erythrocyte sedimentation rate, usually, does not change. The late phase appears gastrointestinal disorders work. Observed phenomena such as dyspepsia, flatulence. Also late stage may be accompanied by abdominal pain, nausea, vomiting, lack of appetite. The presence of Ascaris body reacts and nervous system changes. There may be nervous attacks, sleep disturbances, nightmares and screams in his sleep, insomnia. Often, mental fatigue can quickly advance due to illness, headaches and dizziness. In rare cases, there is a reaction on the part of the organs of vision. There is a fear of light, increase in pupils. On the background of parasitic diseases can be fixed lowering blood pressure. It is also necessary to remember, that ascariasis is a disease, which greatly reduces the protective function of the body. This is due to the fact, that roundworm in humans absorb vitamins B6, A, WITH. Against the background of reduced immunity may complicate the course of infectious diseases. Do not think, that ascariasis is absolutely safe. Medical practice shows cases, when a massive invasion led to the, that the parasites get into the airways, which eventually became the cause of human strangulation. The basis of diagnostic actions are data, obtained in the course of the clinical and epidemiological studies. Severe symptoms of broncho-pulmonary diseases in the period, is not characteristic of their development, and stay in places with a high risk of Ascaris infection is a cause for presumptive diagnosis. KLA indicates leukocytosis and eosinophilia. On the X-ray light detected infiltrations. 100% confirmation of ascariasis will be to identify the larvae in the sputum. They are determined with the help of a smear, but rarely come to light. At a late stage of intestinal roundworm in blood test results reflected anemic, leukocytosis, slight eosinophilia. In the analysis of feces found erythrocytes, undigested food, helminth eggs, parasites themselves. ascariasis treatment is received antiparasitic medicines. To date, there are many effective drugs, which gets rid of parasites. All anthelmintic drugs are based on the same principle: They paralyze the muscular system of Ascaris, which leads to their death. The dosage of the drug administered in accordance with the instructions, taking into account the age and weight of the patient. A few days after receiving anthelmintic drugs recommended reception ehnterosorbentov. To do this, you can drink activated charcoal. After the end of treatment should control analysis. Treatment can be considered effective, if not detected after two of the study feces nematodes. When receiving the medicines from ascaris must remember, that they have a toxic effect on the entire body. In this case, the body is already weakened by the influence of parasites. Restoration of damaged organs with parasites. note! Since these drugs further reduce immunity, recommended intake of vitamins and drugs, strengthen the body's defenses. obstructive jaundice (appears, when roundworm penetrate into the bile duct). accompanied by vomiting, wherein the parasites may be, temperature, chill. Purulent inflammation of the abdominal cavity. We must not forget that, that Ascaris worms can cause mechanical damage and. Damage to blood vessels and various organs can result in hemorrhage, necrosis, ulcerations. Ascarid allergen belongs to the most powerful allergens parasitic origin. Allergic reactions occur not only on the skin, but also in the lungs, conjunctiva, ZHKT. Council! Or not to apply the recipes of traditional medicine - each solution. They will not stand alone treatment effective. And if any of them need, if you take medicines for the treatment of, everyone decides for himself. Garlic broth with milk. head of garlic boiled in a glass of milk until soft. The resulting warm agent is used for enemas for weeks. Enema do at night. You can also use pumpkin seeds. Half a kilo of seeds should be crushed, add 50 ml of water and little honey. The mixture was taken on an empty stomach, and the whole volume of the resultant need to use an hour. After 3 hours the solution was drink magnesia (15-30 grams per half cup water). This means you can treat ascariasis in adults, Do not use it to treat children. Warning yards pollution, playgrounds. Paddock animals in designated areas.